Did you know? 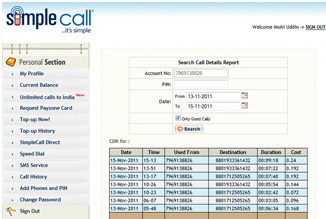 You can now access up to three months of your SimpleCall call history online. That’s right: by signing in to your SimpleCall account, you can view up to three months of calls. The charge for a certified copy of your call history is £5. To request a certified copy of your Call History up to six months, you can call or email Customer Support. Allow 2-3 working days to process your request. Customers need to provide a valid address and contact number. Customers can be contacted when papers are ready.